The Parmanu Tech conference was organized by the Ministry of External Affairs and Department of Atomic Energy (DAE). 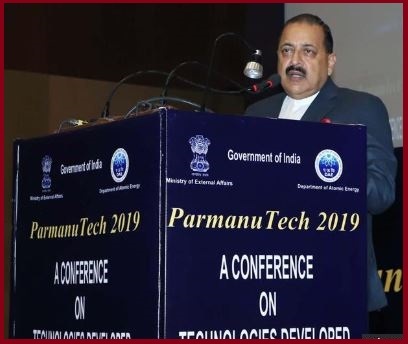 The keynote address at the ‘Parmanu Tech 2019’ conference was delivered by Dr. Jitendra Singh, Minister of State for Atomic Energy and Space. The Parmanu Tech conference is aimed at showcasing the societal applications that the Department of Atomic Energy is pursuing. Health care: Nuclear Medicine and Radiation therapy – Care to cure. Food Preservation, Agricultural & Industrial Applications: From farms to factories – Serving the National Cause. Showcasing India’s capabilities in Nuclear Energy: Energy Security with environmental responsibility – the Onward March.